Dates make a great addition to cakes. Dates make the crumb moist and impart natural sweetness. 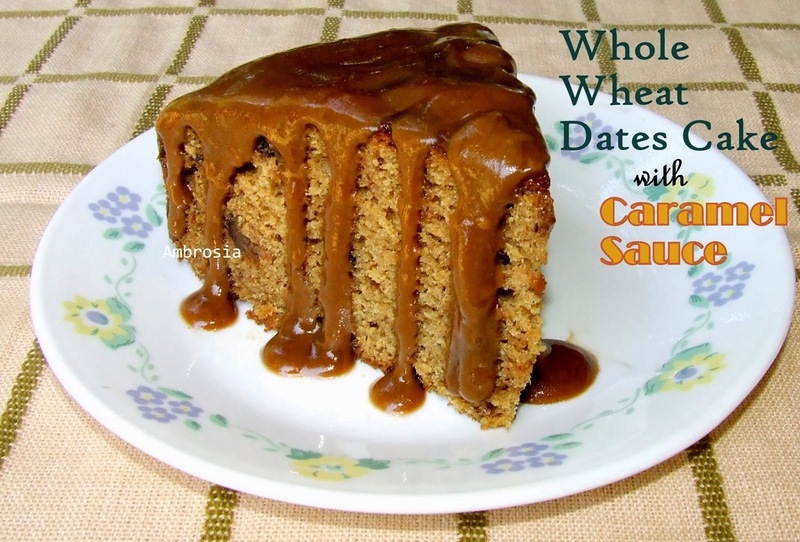 Cakes with dates require very less added sugar. Dates are also a store house of minerals and vitamins. I have used whole wheat flour in this cake. This makes the cake healthy and filling. One slice of this cake is perfect filler with a cup of steaming tea on a cold winter afternoon. Drizzle warm caramel sauce and it becomes a lovely gooey dessert. If you do not like a dense crumb, then substitute whole wheat flour with 1 cup all purpose flour. 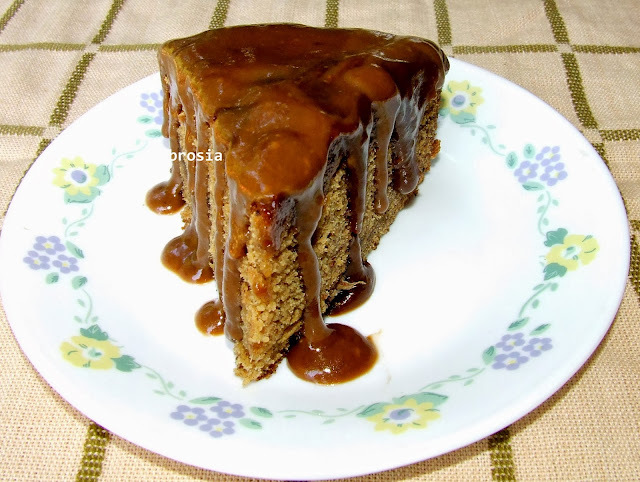 For those who do not want to use eggs in cake, here are two recipes of egg less dates cake. You can enjoy them with caramel sauce. Take chopped dates in a bowl. Sprinkle baking soda, add boiling water. Stir, cover and let it rest for 20 minutes. After 20 minutes, stir well, mashing some of the dates along the sides of the bowl with a ladle. Preheat the oven to 180 degrees C. Grease one 8 inch round cake tin. Line the bottom with a parchment paper. Whisk together whole wheat flour, all-purpose flour and salt. Cream butter and sugar till fluffy. Add eggs, one at a time, beating well after each addition. Add vanilla essence. Beat well. Add dates mix and beat well. Stir in flour mix in three rounds. Mix till evenly combined. Pour the batter in the prepared tin. Bake for 40-45 minutes or until a skewer inserted in the center comes out clean. Stand for 10 minutes, turn onto wire rack to cool. Take a heavy bottom pan. Add milk and sugar. Stir till sugar dissolves. Add cream, butter and vanilla essence. Cook on medium heat. Bring it to a boil stirring constantly till the sauce becomes thick. Date cake with that gooey sauce looks yummy! Sure you can use whole wheat flour instead of 1 cup maida. If the batter looks very thick you may add some mik or water. Thanks! Hi, Can I soak the dates in 1 1/2 cup hot milk n then blend?Would the texture be different,have you tried? The recipe looks similar to egg less version. Hello Binu, yes, you may soak dates in milk.Idea is to soften the dates and get them mushy.Happy Baking!